I am analyzing a corpus of very short texts (3-7 words long). The original unigram and bigram features ($n$ dimensions) are transformed into topic features using a custom LDA (Latent Dirichlet Allocation) algorithm. In other words, the custom LDA algorithm (adapted for short texts) performs the dimensionality reduction. The number of features $m<<n$. The new features are centered and standardized before analysis. However, on my data, the plot looks slightly different. 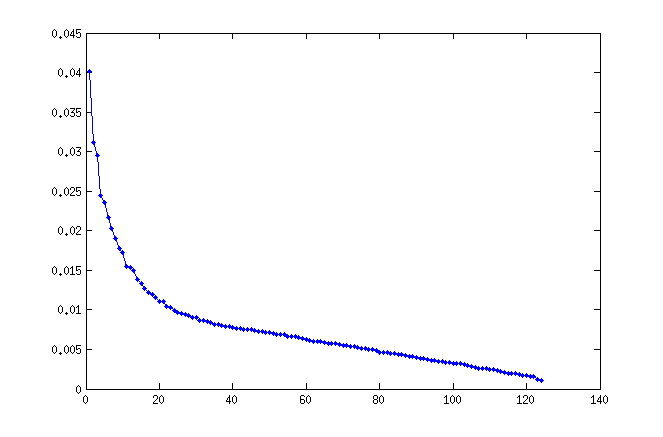 There is a rapid eigenvalue drop but tending to 1, not zero. Then after a plateau, it sharply drops to 0. I am having difficulties understanding this plot. It looks like there are ~20 dominant eigenvectors explaining the most important directions of variance. 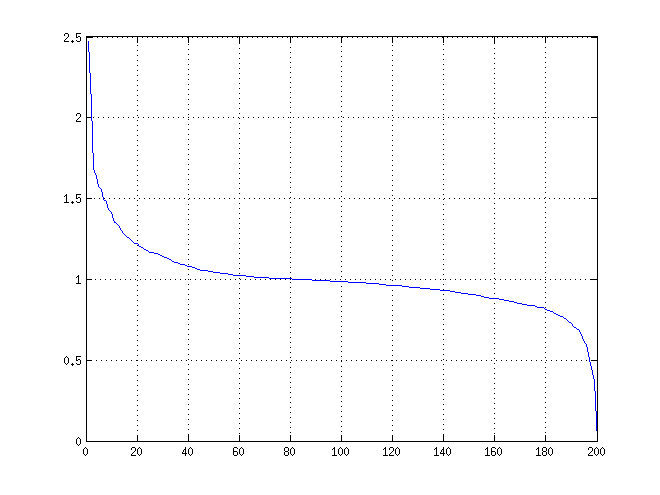 After this "knee", there is a long plateau from ~40-140 where the eigenvalue does not change much around 1. Are those directions capturing noise? Browse other questions tagged pca or ask your own question. Why does eigenvalue decomposition of a correlation matrix maximizes possible variance?